When it comes to plasma cutting, you can trust our ultra responsive DTHC IV. Built into each of our plasma control units by default, DTHC IV has the backing of thousands of fabricators worldwide. Our DTHC IV connects to the computer via a single ethernet cable. Plasma tables vary from one to another with differences in gantry weight, table size, and type of plasma cutter. 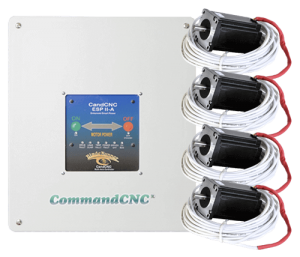 We offer systems with different motor configurations, motor cable lengths, and a wide variety of plasma cutter connection kits. If your gantry weighs up to 100 pounds, this is the system for you. 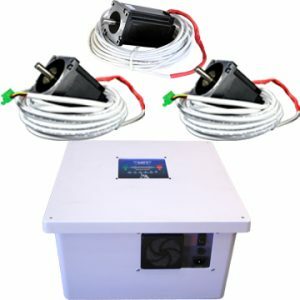 We offer two different motor strengths for this product line: 300 oz./in. motors and 620 oz./in. motors. This system uses a 620 oz./in. motor for the Z-axis and 980 oz./in. motors for all other axes. Built in a rackmount case, CoreCNC is the industrial solution for both plasma and routing. Running exclusively on Linux, CoreCNC utilizes CommandCNC’s realtime feedback for very high and accurate cutting.